En Garde! is my graduation project, currently in development using Unreal Engine 4 with a team of 8 fellow students. The production will end on June 2018. It's an action-adventure game that pays tribute to Swashbuckler films & litterature. 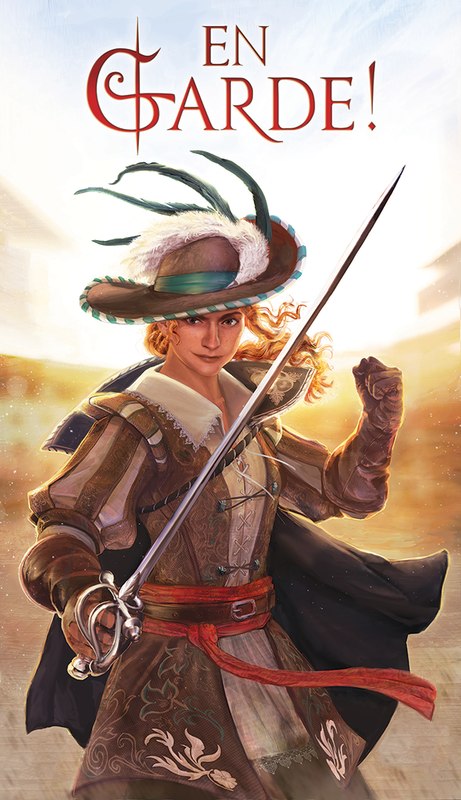 The player embodies an impetuous fencer who fights her villainous opponents with panache and acrobatic skills. The goal is not to kill the enemies but to humiliate them. Parkour system that allows adaptative jumps and vaults with alternating feet. Usable by the player and the AIs. Combat system that allows characters to: chain different attacks, parry, interupt or dodge opponent's strikes. Implementing animations and creating a set of easily tweakable "animations notifications" which can fire various gameplay logics. Complex animation setups that make it easy to define in a combo when damage is applied, when the character can be interupt or is invulnerable, or when player's inputs should be buffered, etc. Obstacle avoidance system for the character that redirect player's inputs. Here the movement stick is always pushed forward. Obstacle avoidance system for the camera, so the player never loses sight on the character. Here the camera stick is left untouched. Highly tweakable obstacle generation tool for easy parkour testing. Spline generated curtains for easy world building. The spline is then used in runtime to deform the curtain based on the wind.